The Abbey Medieval Festival Tournament weekend is held at Abbeystowe, an open field near the Abbey Museum of Art and Archaeology in Caboolture, South East Queensland. A free shuttle bus service will take Festival goers from the Caboolture train station to the Festival site. The shuttle bus service starts its run at 7:45am, with the last bus departing the Festival site at 5:45pm. The shuttle bus timetable will be available online closer to the event, and will be posted at the Festival gate. Visit the Translink website to plan your journey. Free parking is available at Abbeystowe; however it is limited. Access to the Festival grounds is a short, easy walk of about 250m from the parking areas. Disability parking is available. Patrons who need to access the disability parking must have their permit clearly visible for parking attendants. VIP parking is available for VIP ticket holders. Information on parking and accessing the Festival site is provided directly to VIP patrons. Learn more about the VIP experience. The Wamuran Rural Fire Brigade will be assisting with parking over the Festival weekend. They will gratefully accept gold coin donations from those willing to support the rural fire service. Abbeystowe is roughly a 45-minute drive from Brisbane via the Bruce Highway. Patrons driving from Brisbane should take the Caboolture-Bribie Island exit off the Bruce Highway, then move into Bribie Island exit 152. 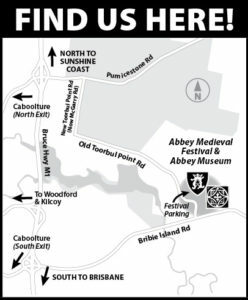 Head for Bribie Island, following the signs for the Abbey Medieval Festival and turn left onto Old Toorbul Point Road. Take Pumicestone Road, Toorbul/Donnybrook exit 157 off the Bruce Highway, drive 1km east along Pumicestone Road and turn right onto McGarry Road. Follow the signs for the Abbey Medieval Festival.